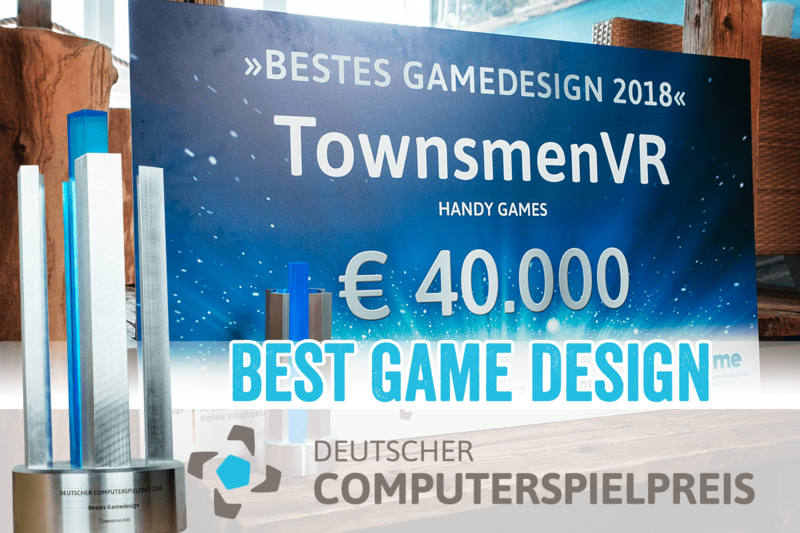 Our virtual reality god-game simulation, Townsmen VR, has been awarded in the category Best Game Design at the German Computer Games Award! We can not begin to tell you how proud we are of the excellent work put in by the entire team to ensure we were able to deliver an innovative game experience that excited fans and critics alike. It is a tremendous honor to not only be nominated in two categories, for “Best Game Design” and “Best Innovation”, but to take home such a prestigious award along with the 40.000 € prize. Congratulations to our fellow nominees and winners and a big thank you to the jury and of course our fans. A medieval virtual reality town! Town-planning: Unlock new buildings and place them freely within your village to optimize transport routes. Sound: Medieval music, adorable sound effects, and a classy English voiceover ensure a fitting atmosphere.